Within the chandelier | It may be cliche to say you must look within to find what it is you’re searching for, but this often holds true with photography. 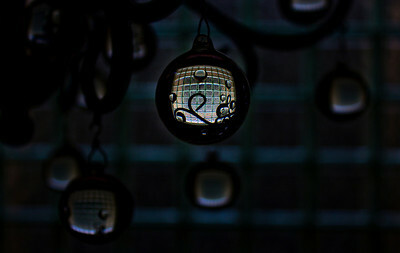 This photo of a hanging ornament on a chandelier was taken in mid-day afternoon glow, but going dark in post processing really brought out the detail. The glass bulbs offered myriad perspectives of the room, but the tile-glass backdrop was hard to resist through this little warped prism. 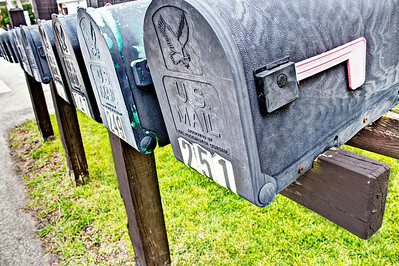 The tangible past | Long Grove, IL has its timeless elements, but the rows of mailboxes lining some of the town’s streets feel distinctly of the past. Email is so temporary compared to a handwritten letter, and the grit of the aluminum, peeling numbers and rusted nails on these boxes seem to relate to the tangible nature of an old letter. Don’t suspect we’ll throw too many emails in a box to read for later. 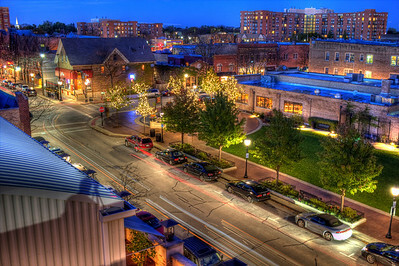 Arlington Heights Self Portrait | This is the tiny Harmony Park in Arlington Heights as it appeared at blue hour in October of 2011. You can see some of the trees are just starting to turn while others have dropped their leaves completely. If you look closely, you can see why I call this a “self portrait.” I appear in the image, which is a reflection of my growing up years in Arlington Heights – warm and almost entirely positive memories. The village does a great job of decorating downtown for the holidays, but I believe these trees in Harmony Park remain lit year round. This photo hangs at Village Hall in Arlington Heights at 33 S. Arlington Heights Rd. Feel free to visit if you’re in town. 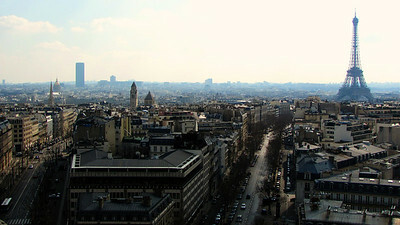 Parist to the southwest from Arc de Triomphe | To me, the Eiffel Tower seems like the worst way to see Paris. Why remove the city’s greatest landmark from your vantage point in order to find an above-the-city perspective? The Arc de Triomphe’s roof, 164 feet (50 meters) above street-level serves as a magnificent stage for photographing La Ville-Lumière. This photo, from a point-and-shoot Canon SX120 IS, keeps the city’s anchor in frame. The white wall of clouds almost acts as a curtain with blue haze separating the foreground from the photo’s background. The hint of a pastel sky pays homage to Rococo. 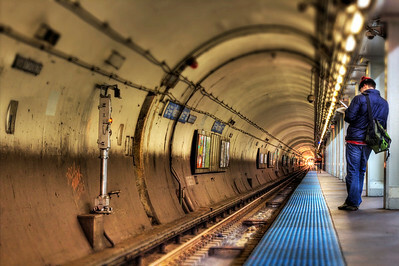 Washington L tube lit | The subway section of The Chicago ‘L’ can be a dark and dingy place, especially late at night when trains are often delayed some ten or 20 minutes. This was one such night. After waiting a quarter of an hour, these lights finally warmed the tunnel both literally and figuratively. At the Washington stop the tunnel is so straight you can see the next few stops to the south very clearly. This train happens to be waiting agonizingly close at the Monroe station a couple of city blocks away. When it finally arrived it was packed with people, and the car felt as warm as an oven. 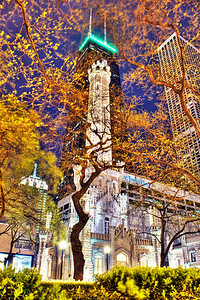 The Hancock over Water Tower | The Chicago Water Tower is the only public building in the “burn zone” that survived the Chicago Fire of 1871. 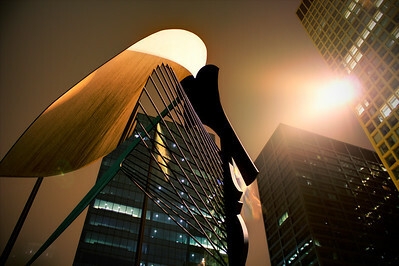 Ever since, it’s been considered a symbol of Chicago’s past and phoenix-like rise to Global City. While developments like the massive Hancock building have overtaken the water tower in size, it’s stature is still quite great in Chicago. 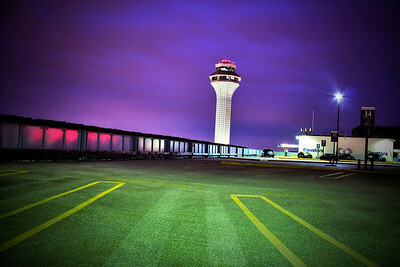 This photo was taken on a very windy night, which sometimes makes taking HDR images very challenging. In this instance, however, the blurring of the trees’ branches creates a kind of chaotic framework around two of the city’s most treasured landmarks. 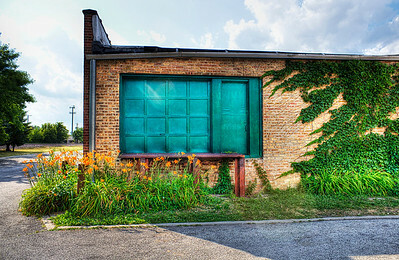 The green door | I stumbled on this alleyway in Edison Park while trying to find a preselected location to photograph, but the kelly green door proved far more interesting. My plans change that way almost every time I go out shooting. This cared-for corner that faces some apartment buildings and cozies up against train tracks is around the bend from a little hospice called Loving Hands. It looks like the same hands planted the flowers and trimmed back the vines. 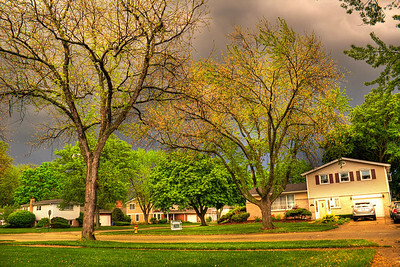 That golden glow before a storm | I’ve heard people say everything goes green before a tornado. Often times before an afternoon storm the sunlight ahead of the front seems to bounce off the dark clouds to produce a golden light that tugs at the greens and makes them pop. The yellows jump out at you, too. Picasso in mist | Shortly before midnight on a misty night the Picasso in Daley Plaza looks more mysterious than usual. The two light fixtures (only one is shown here) pointed at its nose cut through the fog and create this surreal atmosphere that is equal parts light and dark. Speculation abounds that Picasso created this 50-foot (15 m) sculpture after model Sylvette David. If so, on a misty night it’s as if she’s peering upward into the light. On a more typical night she merely bathes in the glow from above. 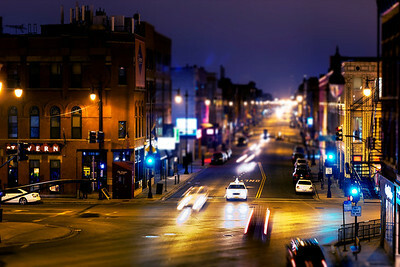 Cab flow at Damen | Damen is my favorite stop along Chicago’s blue line. There’s a ton of nightlife going on, but I’ve never been a part of that. I love the platform of the L station here. There are several vantage points that lend spectacularly to photography, and this is one of them. This is the scene looking east on North Avenue. Yes, that’s confusing if you’ve never been here. It’s a freezing cold night and relatively quiet for the Wicker Park neighborhood, even on a weekday. By the time I grabbed this capture around midnight my hands were nearly numb and snowflakes were starting to fall. The lone cab is waiting to turn left while others blitz past him. Bus stand minimalism | I don’t often manipulate my photographs beyond the application of HDR and some relatively minor touch-ups. This is different. I like the stark minimalism of the original, but having known some very talented graffiti artists from my college days, this looked like the perfect place for them to do their work. The two photos below are the exact same photo, but the second is “liquified” via Photoshop to achieve the warped look on the tile. Hanging out with my friends, I decided if I was ever a graffiti artist my tag would be the word “Left” for myriad reasons, but mostly because you could play with it in so many ways. Here I decided to yank on these tiles rather than leave my tag. 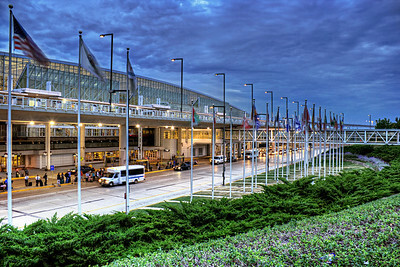 Anyway, the shot was taken at a bus stand on a narrow strip of Chicago property that connects O’Hare Airport to the city proper. 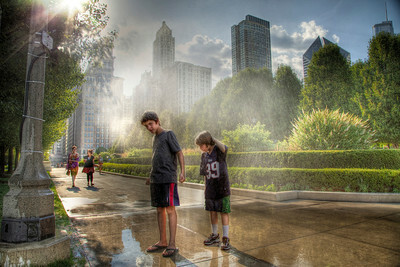 I guess if Chicago can get away with that I can toy with the outcome of the photo as I please. 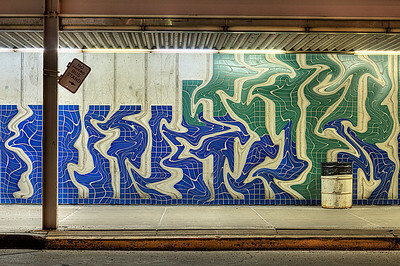 Bus stand graffiti tile | I don’t often manipulate my photographs beyond the application of HDR and some relatively minor touch-ups. This is different. I like the stark minimalism of the original, but having known some very talented graffiti artists from my college days, this looked like the perfect place for them to do their work. The two photos below are the exact same photo, but the second is “liquified” via Photoshop to achieve the warped look on the tile. Hanging out with my friends, I decided if I was ever a graffiti artist my tag would be the word “Left” for myriad reasons, but mostly because you could play with it in so many ways. Here I decided to yank on these tiles rather than leave my tag. 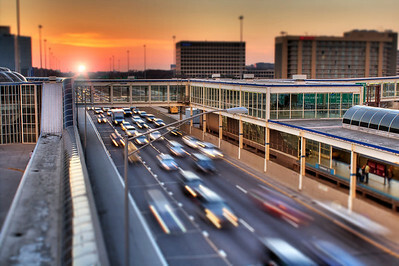 Anyway, the shot was taken at a bus stand on a narrow strip of Chicago property that connects O’Hare Airport to the city proper. 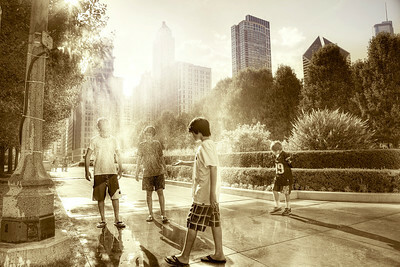 I guess if Chicago can get away with that I can toy with the outcome of the photo as I please. Ambleside row houses | A name like Ambleside suggests a walking community, and with around 3,000 inhabitants this English hillside town at the top of Lake Windermere in Cumbria is exactly that. Built up on top of itself, Ambleside offers spectacular views of the picturesque Lake District. 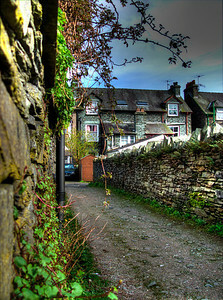 This little row of cottages near the town center is typical dwelling in Ambleside. Stone walls, gravel drives and color adorn most everything. It would be quite a challenge to find any area of the UK more quaint and beautiful than the Lake District. This photo, taken on a point-and-shoot, is three exposures and hand-held against the stone. A lot of control | With the sun already setting behind O’Hare International Airport I decided to get as high up as possible to catch the control tower against the magenta clouds. The massive parking garage, which stretches across three huge terminals, is the only place I know for such a vantage point. The sixth floor was eerily empty on this night. Cheap fluorescent bulbs that light the parking lot create a greenish hue in the pavement which contrasts nicely with the pinks and purples. 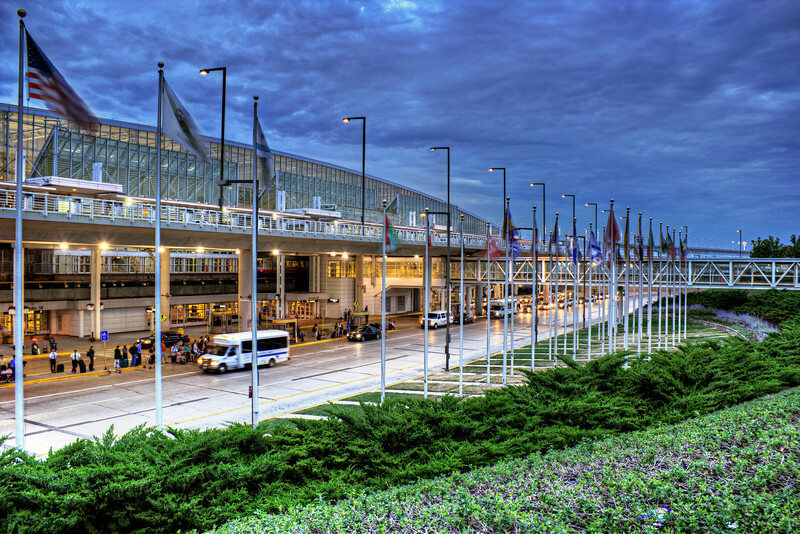 International 5 | The international section at O’Hare airport is numbered as the fifth terminal at an airport with only four terminals. I guess the international terminal was No. 4 back in the day, but due to renovation became No. 5 and no No. 4 was ever reopened. Most times I travel the trains between hubs I see an out-of-towner gazing up at the airport map trying to figure out where No. 4 went. No. 5 is pretty, especially during blue hour on a cloudy night when the flags are flapping. 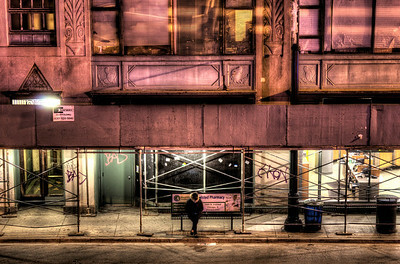 Lady in the street | It was a long light, and she waited there very patiently while the traffic screamed past her. 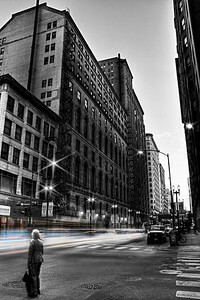 When I processed the image it looked like her hair was being blown by the moving cars. It was probably just a breeze, but there’s this quality to the distance between her and the streak of light rushing by. It’s like a force field that will not let her go a step closer to wherever she’s headed. Fire truck cuts through fog | I like foggy nights. I’m not sure what I like about them more — the magical quality of the blanketing clouds or the fact that everything seems to slow down as if to hesitate in these conditions. I’d been taking photos for a good hour in this murk when I heard the fire truck coming. In three exposures I captured the truck at the beginning, middle and end of the small portion of the street below and was very fortunate to get so much of its lights as the timing had to be perfect. Trying to retain as much of the mist as possible took quite a bit of work, but it feels moody and quiet outside of the rush to conflagration. I wonder what it’s like to fight a fire in the fog. 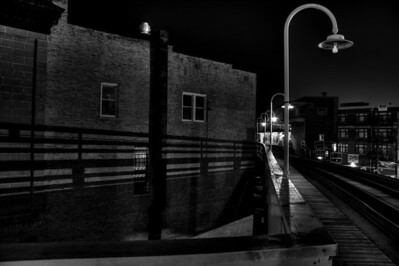 End of boardwalk | Damen sometimes feels like it was ripped straight out of some film noir. Maybe its the ubiquitous cabs scurrying about below making me think of Taxi Driver. I’m not sure. It’s probably more of the light that reminds me of that film. 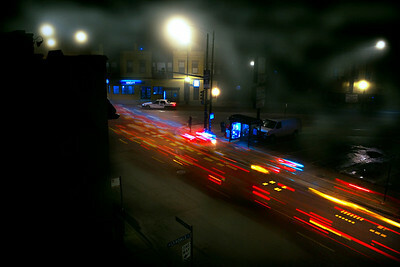 A lot of strange colors pop out at Damen and give it this restless unease. But then black and white is the origin of the noir motif, and Damen photographs very well in this way. 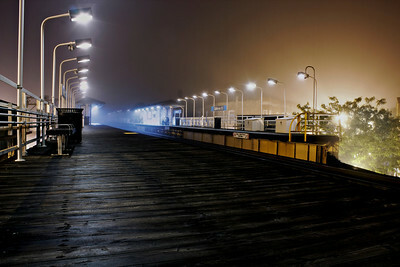 I feel like some Chicago mobster could walk up this very boardwalk into the frame. There’s also something sinister about the wrapped rail shadow raking across the brick building. Truck under Lake | By “under Lake” I mean Lake St., where the elevated train tracks cover the road and make this tunnel-like space for cars and pedestrians. This truck was actually moving quite slow, maybe 20 mph, which gave the perfect opportunity for a motion blur capture. Due to the golden city lights there’s a lot of yellows and cyan colors off the blue-glass buildings, so the light really jumped out in the blur lines. Whereas most HDR images I make come from an average of three to five photos, this is a single raw file. 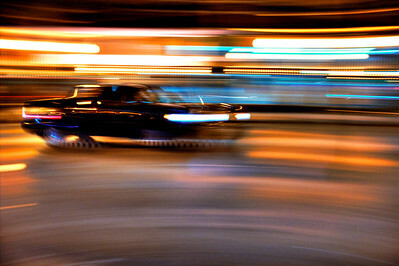 After processing I was very happy with the bands of light and the warping of the vehicle. There’s still some good in-focus detail in the side of the truck, as well. The curving of the road must’ve occurred as I swooped the camera from left to right for the one-second exposure. 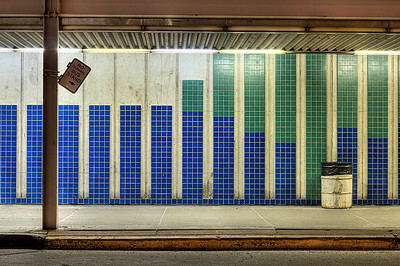 The blue line guitarist | I wonder how many people are like me on this one. 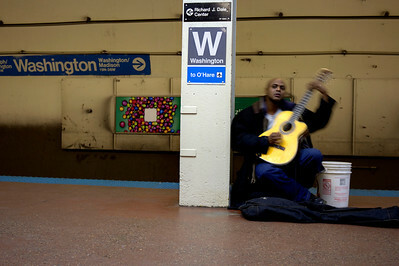 Whenever I head into a subway in any city – be it Chicago, New York, London, Paris or Washington D.C. – I hope to hear street musicians. There’s this anticipation as you head for the initial descent that you might hear something special in the grungiest of places. The notes echo up quietly from inside the cavern of the tunnels and only grow warmer and louder as you draw near. It’s this perfect mix of curiosity for what’s to come and enhancement of setting. The street musicians make waiting for a train bearable with the beautiful melodies they bounce off those decrepit walls of darkness. This particular guitarist, I believe, is Chris. He’s really nice to me, and we talk almost every time I see him. He always welcomes me taking his photo and I made a video of him once, too. I think Chris doesn’t mind the attention, because I don’t hurt his “sales.” People tend to walk up and drop money in his bucket when I start taking photos, but it’s nothing that I’m doing. They really like Chris’s music. I think I’m just an icebreaker for them. Chris’s notes spill off his guitar and climb and fall like a haunted organ in the great hall of the mansion in Edward Scissorhands. He’s truly a fun listen. I keep telling Chris that I need to get him a copy of this photo. It sums him up completely as he’s always in motion and so focused on the music. If you ever see Chris, make sure to drop a dollar in his bucket and tell him he can download his photo from this site. It’s been a while since we’ve bumped into one another. Moving man at pigeon rock | No, it doesn’t actually carry the name “pigeon rock,” but it looks like it should. 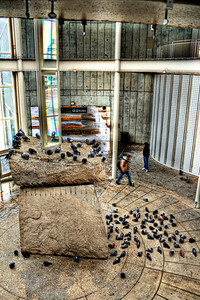 In winter, this bus depot atrium is full of birds to the point you have to worry about stepping on them or in their stuff. I’m not sure why they hang out here. It’s an open-air space, and the wind can still come through pretty fiercely. Still, they wait out winter on this oddly shaped rock sculpture-thing and the coarse floor. Many of them hide up in the recesses of the glass ceiling, which is funny because there are anti-bird spikes all over the place, and yet they avoid the barbs quite comfortably. You can see some of these spikes along the base of the cream-colored beam curving through the upper third of the photo. 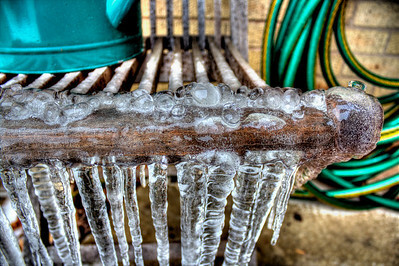 This was taken in the dead of winter at temperatures right around freezing. The guy in the dark hoodie must be freezing! The guy in the brown coat’s got it right. Keep moving! When fireworks come to you | I don’t have to travel too far to enjoy the fireworks. They’re right outside my back door. Of course that means there’s a festival a few blocks away, and someone parks their car in a way that nearly blocks your driveway, and they walk through your lawn, because, well, just because. Halfway through the fireworks display I pulled a table out into the yard and got my ladder out of the garage. I placed my tripod on the table and telescoped the head as high as it could go. My camera stood about 8 1/2 feet off the ground for this shot, so I had to climb 3/4 of the way up the ladder just to reach it. 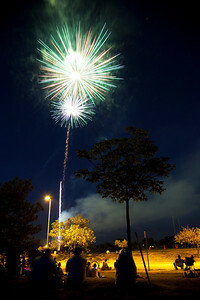 I fired off about 50-60 shots of the fireworks, but this image is comprised of just four. 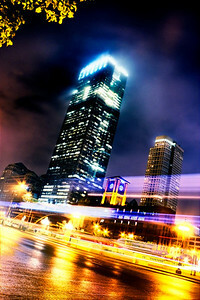 Long exposures are great for capturing everything but the finale, which photographs best in shorter bursts. This photo happens to be part of the middle of the display. When you’re standing there watching, everything between you and the fireworks kind of melts away to the point that you don’t even notice the trees and power lines. I decided to leave them in so you can see my cluttered but outstanding view. Stay off my lawn and out of my driveway, OK? 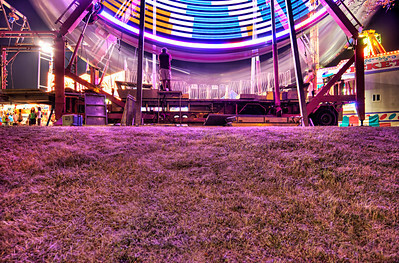 Under the Ferris wheel | The little festival near my house wound down tonight. I remember as a kid always wishing it would last longer than it did. My favorite ride was called “The Enterprise.” It was basically a Ferris wheel that started off parallel to the ground, or horizontal, and then slowly tilted up until it was vertical. Within the wheel the cars spun ultra fast – to the point that one year my friend Tony got a nosebleed from the spinning alone! Tony was 1/16 Cherokee. I just remembered that. This is the backside of this year’s Ferris wheel. I was equally drawn to the flashing lights and the whirring of the cars as I was to the magenta hues it cast upon the grass behind it. We need rain badly, and much of the yellowed grass soaked up the thick pinks. Some green still pokes through. The original Ferris Wheel was built in Chicago in 1893 by a guy named Ferris. Makes sense. 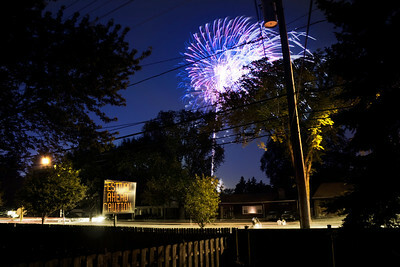 Bonus fireworks | A few days after the fourth the neighborhood fairground blasted off a second fireworks display. The 4th of July show lasted about 20 minutes, but this one only entertained for about half that time. It was pretty while it lasted. Since we got bonus fireworks I thought sharing the second round of explosions would only be right. 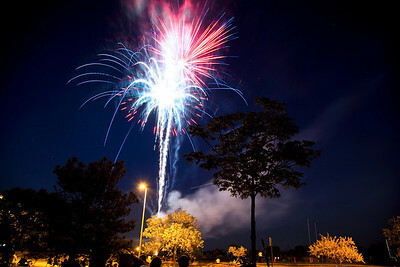 Here are two images of our latest round of bombs bursting in air. We were so close that some of the debris from the exploded shells settled on and around us. 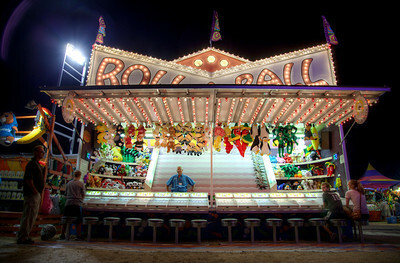 Ball & pony show | Roll-a-ball taught me one valuable lesson as a kid: only play select carnival games, especially late in the evening. I guess it’s not that valuable a lesson, but it’s still one I learned. This is one of the few games where you play against other people rather than against the game itself. If you play late in the evening, when you have fewer opponents, you have a better chance of picking up a prize. Really, though, why would you want one of those stuffed monstrosities? Moving along, the guy in the blue shirt presiding over the Roll-a-ball horse races is Bob. 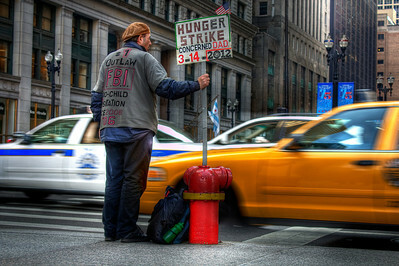 He gave me a hard time about taking photos of his stand, but it was all good-natured banter. “Is this gonna be on the internet?” He asked. Yes. He laughed sarcastically as if to approve but feign disinterest. Bob is very good at his job – playfully needling people to entice them to play. You can tell he was a former radio disc jockey or something along those lines and is very, very quick on his feet. There’s a reason he’s on the microphone. I had fun listening to him. Hopefully Bob remembers where to find his picture. 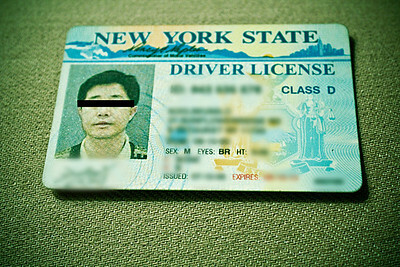 My new fake ID | I recently purchased a Canon 5D Mark II. I opened the package from UPS, because it looked right. The camera box also looked right, so I opened that. Once inside the first flap, however, it started to look wrong. There was a pink post-it note with “The battery is inside the camera, thanks” scrawled rather legibly — but any scrawling at all on a post-it note on a would-be new camera box is rather wrong. That’s red flag number one. Inside, I found the battery packaging open, some other packaging open and creases in the warranty paper work. That’s red flag number two. Also, I found no packaging receipt. Red flag number three was very interesting. Noticing that the camera itself looked to be in perfect shape, I decided to turn it on – after all, whomever left the pink note had already left the battery in the camera. It turned on. The screen displayed a message in Korean. Everything was in Korean. Everything. The menus were in Korean, so I had to use my other Canon to match up the menus and figure out how to place the camera into English (which it should have been factory) and continue problem solving. I decided to open the manual to see if anything else was off with this particular camera… and that’s when this driver’s license fell out and onto the floor. The license sat there at my feet for a few seconds as I stared at this development in disbelief. Fearing that my camera was not in fact new, or perhaps even hot, I called the seller to rectify the situation. After three phone calls with them and a visit from the local police to search the guy’s ID for a police record and the camera’s serial number to see if it was reported stolen (this was encouraged by the seller), everything came back clean. It turns out my camera was probably a return that got mixed up in shipping and sent out as “new,” which it certainly was not. My new new camera arrived rush delivery a day later. I received a $50 credit for future purchases from the seller, and I shipped back the bogus “new” camera once the new new camera was in my possession. I’ll be reimbursed for the mailing costs. In the end, I’ve also acquired a great new fake ID – which looks nothing like me – and expires a few years from now. Why this ID was in the box remains a mystery. I’m tempted to mail it to the man who obviously lost it, but I’m almost certain he’s gotten himself a new ID by now. I’m tempted to keep it as part of a very strange story. The police said I could. I took the photo of the ID with my Canon T3I while waiting for the second 5D Mark II. 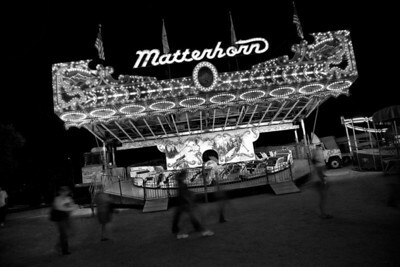 Anti Matterhorn | In the waning hours of its final night the carnival ceases to exist on its own. It is Sunday night and despite a hard close at 11 o’clock the people migrate away from the flashing lights and the color of the event into the surrounding darkness prior to deadline. This leaves an unsettling feeling that the festival is dying a premature death. The band’s energy from the corner of the park no longer pulses through the crowd. It now blares over the drone of the whirring rides and fewer, lesser voices. The rides grow more and more vacant. People pass them as if the fun has washed away. The Matterhorn no longer matters. Dark to light | Alleys are special places. They lend drama. 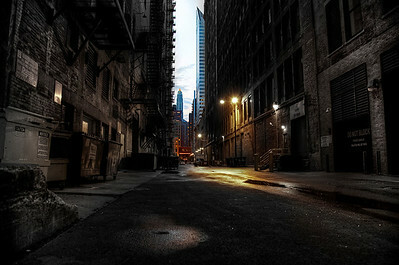 This is simply one of the more beautiful alley-scapes I’ve found in Chicago. There are several great little slivers like it in the Loop, but this one is so alive with darkness and lightness and color. I’ve told this to several people while walking by, but nobody seems to agree in the moment. I hope reproducing it as I experience it lends to understanding its beauty. I stop to look each time I pass. Up the ramp | Sometimes getting a photograph gets tough. I was stopped by security before taking this photo. They wanted to see my press pass – for a free event in an open park. I said I didn’t know I needed to check in, so they made me go check in. Funny thing about security, especially in a laid back environment like a free concert – they’re disorganized. Instead of escorting me to the press table, they sent me there on my own. Once in contact with the press staff, I mentioned that I had already gotten all of the shots that I needed, save a few. If they could just give me a pass so their staffers would stop bothering me, I’d be happily on my way. They obliged. I’m not sure why security puts up such a front for photographers. Wouldn’t the Grant Park Orchestra want a little extra pub anywhere and any way they can get it? Their production of Perfectly Frank: From Broadway to Hollywood was pretty good. I enjoyed my 15 minutes of listening while shooting. 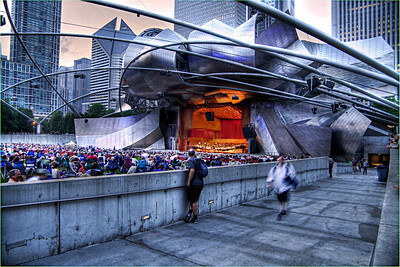 These Grant Park Music Festival offerings at Millenium Park are pretty good. There’s a concert in the park Tuesday thru Sunday almost every week all summer from June 12 thru August 18. There, I think that qualifies as a donation. The man coming up the ramp looked very disappointed. I’m not sure why. I decided to capture him in motion to blur away his grimace. Maybe he was just tired under the weight of his backpack while going uphill. I thought his struggle mirrored mine; I wasn’t too bothered by security – but why the five minutes of hassle? The engagement | You know the saying “it’s better to be lucky than good?” I understand the sentiment, but I prefer to be good over lucky. There’s something to be said for preparedness and dedication to craft that work in concert to help you create your own luck. Then, sometimes you just feel like you’re lucky and you can be OK with that. That is the case here. While waiting for people to exit one end of Crown Fountain at Millenium Park, I quickly noticed a couple going through the routine for their engagement photos. Without giving it more than a couple of seconds thought, I flipped my lens to the left through a metal guardrail, ripped my wheel to 1.6-second exposure and fired. The idea was that only the couple would stand still – creating blurred movement all around them. It worked, and after a good 90 minutes of post-processing to create five TIFF files for an HDR build things feel right. I almost stopped the couple to tell them I’d email them the final result, but I didn’t want to infringe on their photographer’s business. It felt wrong to get in the way. Maybe they’ll find it here some day, but I kind of like the idea that there’s one last photo from their shoot out here in limbo. Makes you wonder how their photos turned out. Ohio Street Beach | Nineteen floors up inside the W Hotel Lakefront, Ohio Street Beach looks tiny, which it is. Not until the 1960s did the beach take its current form after the massive Jardine Water Filtration Plant went in (just beyond the beach jutting out parallel to Navy Pier). Jardine is the world’s largest purification plant, which makes it appropriate that it helped form one of the smallest beaches in Chicago. 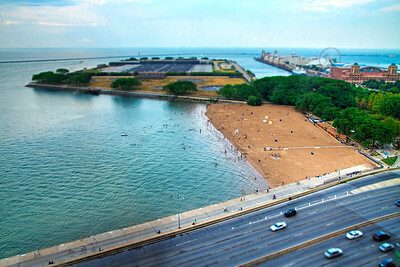 This beach faces north – atypical among Chicago’s coastline swimming areas. That’s north-south Lake Shore Drive in the foreground. 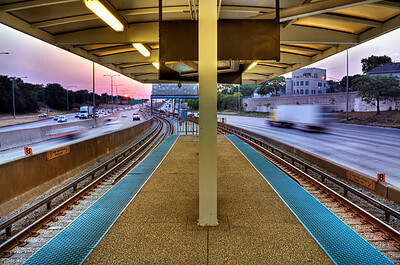 East-only Ohio Street actually terminates prior to reaching LSD. I put a tilt-shift effect into the post processing on this photo in order to illustrate the itsy-bitsy beach. It actually feels a bit bigger when you’re down there, but only because of the space between the trees and water – and then the fact that you’re in one of the few open areas in a city dominated by massive skyscrapers. But It’s hard to mistake the fact that there’s just one lifeguard stand. Make sure to click through to smugmug to blow up the image. There’s a ton of detail in this one. 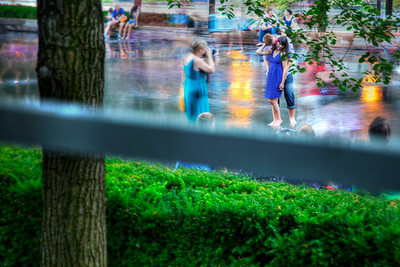 By The Bean after the rain | It rained and rained and rained, and when it finally stopped the moisture came back up out of the ground and created this muggy hang on everything. The ground felt warmer than the air, and yet it was cloudy and soaking wet. Just as the clouds passed downtown the sun reached a point on the horizon behind the buildings where everything became back-lit and glowing. The tourists realized this was their moment. So did I, I guess. 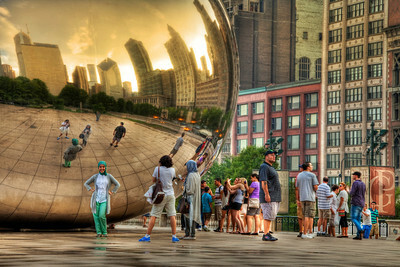 Cloudscape, or “The Bean” as everyone calls it, is potentially the most cliched Chicago landmark for photographs. Because of this I try to avoid it, but somehow I keep finding myself looking at it trying to find a new angle. Maybe that’s high praise for its value as a sculpture – that it is so popular, and still people are pulled in to capture those mirrored curves. This is one of three photos which required a lot of work to get all the blurring off of the moving people. One Prudential Plaza – the shorter, boxy building with the slender tower on the far left inside the Bean’s reflection – was once the tallest in Chicago. Or, as my humanities teacher put it, “the closest place to heaven.” I think this should’ve been considered for a financial slogan. Cooling off | Bonus day – two photos, less type. I was told by one person that they like my writing on these posts, but two people said I should limit my words. I’m not sure how I feel about this, but I’m going to keep it short today. These boys are from Argentina. It was 99 degrees. They stood under a hose attached to a streetlight. The second image was actually taken prior to the first. There are a few different ways to discern this. Maybe you can find one. Cooling off two | I decided to post this one along with the first for a couple of reasons. First, I don't see myself coming back to the same specific scene a second time, and I like this picture. I want to share it. And second, there's a completely different feel to me in this second photo. I'm not sure what it is, but it is there. Gradual left gradual right | I took this just after midnight when driving through a massive thunderstorm. I had my camera out trying to capture lightning over a freight train, but it never materialized. 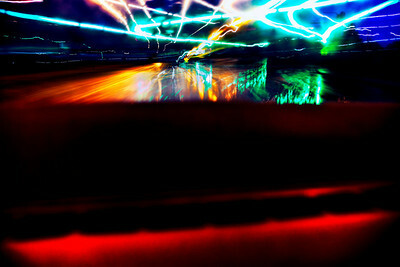 Rather than putting the camera away, I left it on the dash and took a few 10-second exposures on the way home. This was the last and only 20-second exposure. 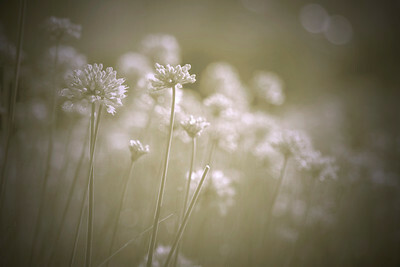 I focused the camera on the road in front of me at a stoplight and then released the shutter after driving for a while. It just so happened that I made a gradual left and then right while taking this exposure, making the street lights and green lights look like they slide across the horizon. I’m not sure where the reds come from, but I found them in post-processing. Millennium flowers | There’s a little garden of native flowers at the south end of Millennium Park. I get the concept, but the display can look a bit jumbled if you don’t know why they are planted the way they are planted. Then again, close up they look pretty good with a blurred background. I have no idea what these flowers are called. Help? They’re purple, by the way. Stacked chairs, buildings | My friends are assembling a set for a comedy show. I’m sworn to secrecy on the matter until October, I believe. I can say that the show requires a bunch of tables and chairs. I don’t think I can share much more than that. Anyway, while the carpentry and lighting specs are measured out the chairs and tables wait outside. The chairs were stacked rather imperfectly in the hallway on the 16th floor of Trump Tower, which has unique site lines on the rest of the city. 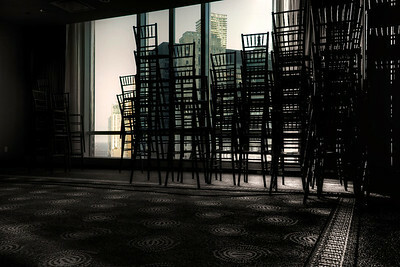 I liked how the buildings out the window mimicked the chair-stacking in a way. Or is it the other way around? I had to sit out here for a while because I felt like I was in the way of the lighting guy. He had a lot of lights. Ok, honestly, I just headed to the hallway because I really wanted this shot. Working green | For a while I thought the green movement was a fad, but it seems like it’s caught on. I’ve worked in plenty of offices now that try to conserve paper use when they used to burn it like nobody’s business. Personally, I use almost no paper on a daily basis. The fountain is really that green! This is the lead-up to St. Patrick’s Day, when everything goes green in Chicago, from the buildings’ night lights to the river to this little fountain. I’m fairly certain the man is working or studying during a late-afternoon break, but it would be much better to know he was sketching the waterfalls. We don’t actually know if this is the case, but at least he picked a great space for inspiration. I almost painted his water bottle green, but because very little touch-up went into this photo I chose not to doctor it any further. 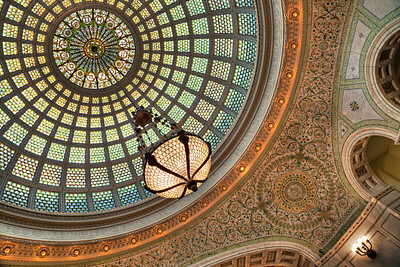 The domed ceiling | Inside the Chicago Cultural Center’s south end is a gorgeous room detailed to the tiniest degree. I’m stumped for words to even start describing it. Honestly, the picture says enough to display both the room’s beauty and grandeur. I framed it this way so the hanging light comes right at you as it does in person. The color and light force your attention upward through the rotunda. It’s amazing. When I was a little boy I saw a performance of Mr. Rogers Neighborhood, a local PBS show, in this very room. I think Lady Aberlin’s dress was blue and Mr. Rogers’ cardigan gray. Somehow, I remember going “back stage,” which was just a side door into a stairwell. I remember nothing of the performance, but at the time I did think the room was a bit elaborate for Mr. Rogers. Stairs to the dome | I’ll rarely post photos from the same scene on back-to-back days, but this one needs a bit of context, I believe. To get to the domed roof I published yesterday you climb this masterpiece of a staircase within the Chicago Cultural Center. The marble is so solid it’s as if it could last forever. 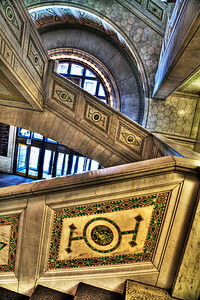 There are a lot of great staircases in some of the older buildings in Chicago. I’ll have to find and share a few more during the lifetime of this blog.